The best-selling saloon car in the world, the iconic Toyota Camry, has returned to Ireland after 14 years as a 2.5 litre self-charging hybrid – meaning it charges itself without the need to plug-in. 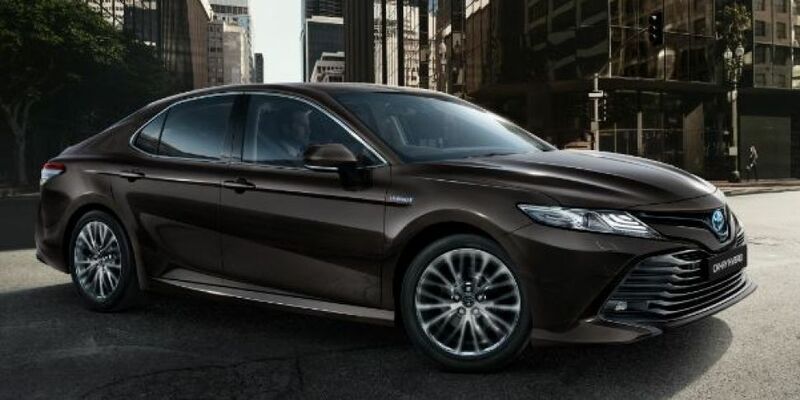 The 2019 Toyota Camry is a 4-door saloon which boasts state of the art technology, elegance and comfort with excellent fuel economy of up to 5.3L per 100km or up to 53.3mpg meaning that road tax is from as little as €180. Thanks to the Hybrid powertrain, the Toyota Camry offers a quieter drive, up to 30% better fuel efficiency, 30% less maintenance costs, up to 40% less C02 and up to 90% less NOX emissions. Tune into Newstalk Breakfast all week from 7am for a chance to win a brand-new Toyota Camry Hybrid for twelve months. The use of a brand-new Toyota Camry Hybrid for a year, with insurance and road tax covered by Toyota for the 12-month period. By entering this promotion, participants accept, without limitation or qualification, the Terms and Conditions. Prize: The prize is a new 191 2.5litre Toyota Camry Hybrid Saloon on loan from Toyota for 12 months. The Corolla Hatchback will be supplied to the winner no later than the 30th of April 2019. The winner will have the use of the vehicle for 12 months from the receipt date of the vehicle. The prize includes 12 months of road tax and fully comprehensive insurance paid by Toyota. Toyota remains the owner of the vehicle throughout the 12-month loan period. The winner must ensure that the insurance disc remains clean and visible within the windscreen insurance documentation pocket throughout the loan period. The vehicle can only be driven by the fully insured prize winner during the 12-month loan period, and it is their responsibility to ensure this condition is adhered to. Should a non-insured person drive the vehicle and cause damage to same, the prize winner will be liable to cover the full cost of repair and have the car repaired to its original state at a registered Toyota dealership in Ireland. Should a non-insured person drive the vehicle and cause such damage as it is considered a ‘write-off’ by a professional adjudicator, the prize winner will be liable to pay back the full value of the car to Toyota Ireland at the end of the 12 month loan period, as assessed by an independent expert. Legibility: Winner must be resident in the Republic of Ireland, be aged between 25 and 65 throughout the 12-month loan period and hold a full, clean license during same duration. If their status changes during this period the winner is under obligation to notify Toyota Ireland through their agency, Teneo, immediately. In such instance, Toyota Ireland reserves the right to notify Toyota Ireland through their agency, Teneo, immediately. In such instance, Toyota Ireland reserves the right to amend or terminate the loan period of the prize. Employees, agents, dealers, suppliers, friends and family of Toyota Ireland are not legible to enter this competition. There is no cash alternative and the prize is strictly non-transferable and needs to be returned to Toyota exactly 12 months from the date of initial receipt. The vehicle collection and drop-off days and times must be agreed with Toyota Ireland ahead of time. The vehicle must be collected and dropped-off by the competition winner at Toyota Ireland on Killeen Road on a pre-scheduled day and time. Where possible, Toyota Ireland will endeavour to accommodate the prize winner. Winner Notification: Newstalk will provide details of the competition winner to Toyota’s PR agency Teneo, who will then contact the winner by phone to arrange collection on or before April 30th, 2019. The winner must ensure that they are contactable and their contact details are correct. Damage to Vehicle: Entrants/drivers should take good care of the vehicle and return it in a similar condition to when they received it. Any damage to the car, other than daily wear and tear such as minor scratches), must be repaired by the winner at a registered Toyota dealership before returning it to Toyota. No accessories or parts are to be removed from or attached to the vehicle. The winner agrees that they will not hold Toyota responsible or liable in any way should an accident occur while the car is in their possession. Tax: Toyota Ireland will pay the road tax costs associated with the vehicle. Insurance: Toyota Ireland will provide fully comprehensive insurance for the 12 month loan period. Maintenance: All standard maintenance costs of the vehicle will be covered by Toyota Ireland. The vehicle must be serviced in accordance with the manufacturer’s recommendation at a registered Toyota dealership. Fuel / Other costs: The winner will pay all fuel costs, parking costs, speeding fines and road tolls associated with the vehicle. Prohibited use: Use of the vehicle for racing, pace making, reliability trials, speed testing, off-road use, towing a trailer or use for hire or rewards is strictly prohibited. Any property carried or left in the vehicle is at the driver's own risk. Drivers must ensure that any personal belongings are removed from the vehicle at the end of the loan, as Toyota will not be held liable for any loss or damage. Toyota Ireland’s decision is final in all promotional matters and no correspondence will be entered into. If for any reason this competition is not capable of running as planned, or any other causes beyond the control of Toyota Ireland, Toyota Ireland reserves the right in its sole discretion to cancel, terminate, modify or suspend the promotion. Similarly, Toyota Ireland reserves the right to alter the date parameters of the promotion as it sees fit. Winner’s data will be held and processed in accordance with the latest data protection legislation. Data provided by the winner will be shared by Newstalk with Toyota Ireland and Teneo Ireland where necessary. We will only use the information which you submit for the purposes of administering this promotion. Winner will be obliged to pay €10 for the use of the vehicle over the term of the prize. (note – this is to cover BIK for winner). For a hard copy of these terms and conditions please contact Toyota Ireland. PROMOTER: Toyota Ireland Limited, Killeen Road, Dublin 12.